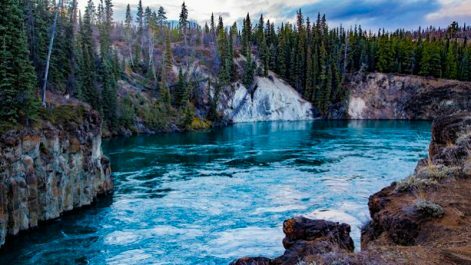 The Great Trail traverses some of the most photogenic locations across the country, but many see the jagged landscape of Yukon as the jewel in Canada’s crown. Perhaps you’re bringing a backpack full of spare lenses for your high-powered camera. Maybe all you need to capture stunning images is your phone and an internet connection. Photography amateurs and aficionados alike will be enamoured with the range of visual wonders in this province. To get the most out of this enchanting wilderness in northern Canada, give yourself four days to explore. Here are just some exciting activities and photo opportunities to consider, courtesy of Travel Yukon. Whether you travelled to Yukon by plane, train or car, you’ll probably need to get outside and stretch your legs! This small city of just 28,000 residents is known as the Wilderness City and is home to a massive selection of trails. 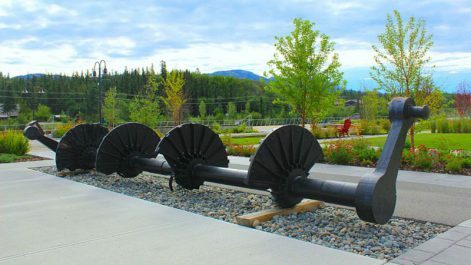 Once you check into your accommodation in Whitehorse, start on the Millennium Trail. Begin on the Yukon Riverfront, and pass the Trans Canada Trail Pavilion, located just behind the Yukon Legislature building. 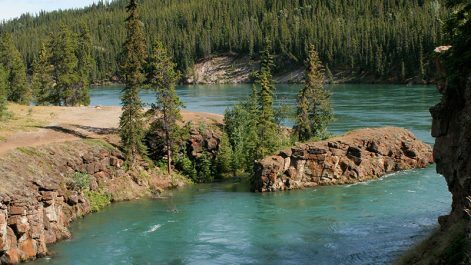 Pass under the bridge and check out the SS Klondike National Historic Site. 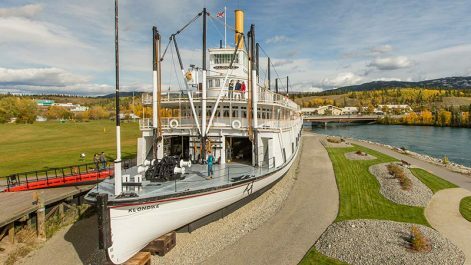 The authentic sternwheeler you see here once brought freight between Whitehorse and Dawson City. Take a photo to capture this historic symbol of Yukon’s Gold Rush heritage. Get back to nature by continuing on the path until Robert Service Campground. The tranquil boreal forest you’ll pass through is a small taste of the natural beauty you’re set to experience in Yukon. 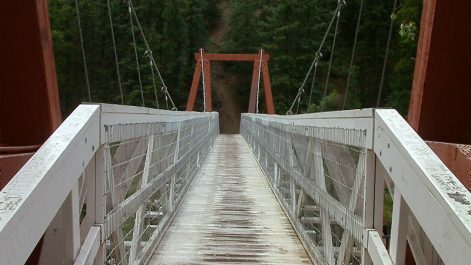 As you cross the footbridge over the Yukon River, set your gaze on the horizon. Look out for whitewater kayakers in the distance, and feel the tremendous spray of water cascading down the Whitehorse Dam. If you’re here at sunset, you’re in luck. Get your camera ready for a stunning shot of your first day. Get a room in the central Best Western Gold Rush Inn in Whitehorse, which provides free wireless internet and a regular airport shuttle for guests. For more accommodation tips, visit Travel Yukon. Dine on the banks of the Yukon River at The Wheelhouse Restaurant. Describing itself as “Yukon Casual’, the restaurant’s 1930s-era décor and delicious menus create a warm, welcoming vibe for your first night in Whitehorse. After breakfast, put on your most comfortable shoes and head straight to Miles Canyon! Let local guides from Who What Where Tours take you through the history of the Klondike Gold Rush. This area of Whitehorse is very popular with locals, so spend some time chatting to people lucky enough to call this place home. For lunch, bring a picnic to Whitehorse Waterfront Wharf before getting ready to depart to the Takhini area. Drive to the Takhini area, about 30 minutes from Whitehorse by car. Once you get to Takhini Hot Springs Road, a section of The Great Trail, visit the renowned Yukon Wildlife Preserve. Home to woodland caribou, Canada lynx, Rocky Mountain elk, Alaska Yukon moose, and more than 90 different species of birds, this important conservation area is a must for any avid wildlife photographers. Before you call it a day, experience The Great Trail on horseback with Yukon Horsepacking Adventures. Ride on the Dawson Overland Trail, a remote wilderness trail that stretches from the Takhini River north of Whitehouse to Braeburn. Historically, it was a Klondike Gold Rush-era transportation route between Whitehorse and Dawson City. As you enjoy a two-hour horseback ride, take in the stunning views of a Yukon twilight. For an early morning pick-me-up in Whitehorse, get some locally roasted coffee from Baked Café or The Claim – two coffee shops that are favourites among locals. When you return to Whitehorse for dinner, go to Dirty Northern Public House, an upmarket gastropub with refreshing beers and live local music. As you check out of your accommodation in Whitehorse, make sure you bring hiking shoes, a water bottle and warm, waterproof layers with you. It’s going to be an intense day! 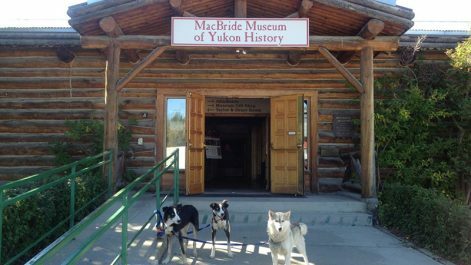 Drive to the Alaska Highway, or “Alcan” Highway, and explore this historic route. Stop by the MacBride Museum to discover the true importance of this highway in local history. 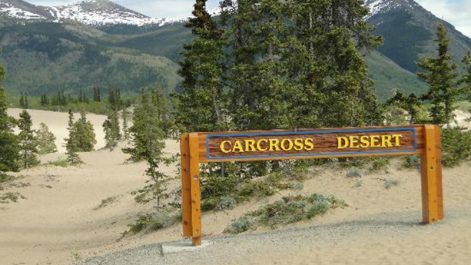 After that, stop by the beautiful village of Carcross, nestled in the Southern Lakes Region. Grab your camera and pause at scenic spots like Emerald Lake and Carcross Desert. Measuring just one square mile, it’s the world’s smallest desert! Spend some free time in Carcross before taking a stunning guided hike with Taiga Journeys. Your two to three-hour hike will afford you some amazing views of the area – perfect for your next Instagram post! When you’re finished in Carcross, drive the scenic route to Marsh Lake, while stopping for photos. When you’ve reached your accommodation, relax and refuel for another exciting day of Yukon adventures! A much-loved Yukon property, Inn on the Lake is a unique rustic lodge at the edge of Marsh Lake. 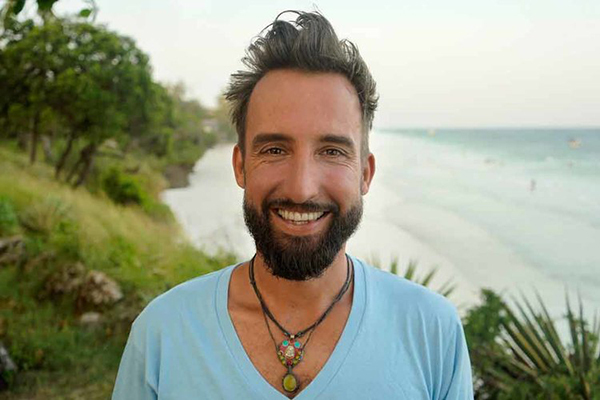 Founder Carson Schiffkorn is an accomplished chef, and offers a cosmopolitan dining experience in the midst of the Yukon wilderness. Start the day with breakfast at Burnt Toast Café, a funky restaurant and café in Whitehorse. For lunch, check out the chic Bistro on Bennett in Carcross. After breakfast, drive back to Whitehorse, where you’ll stay for the remainder of your journey. Today, photographers will get another angle on The Great Trail – seeing it by air and by water! 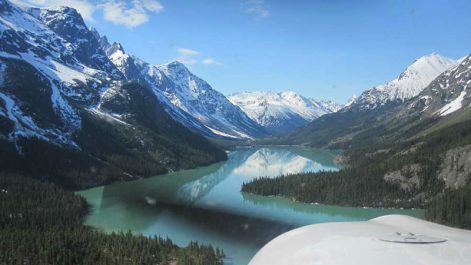 If the weather is good, book a flightseeing tour of the Southern Lakes region with Alpine Aviation. As you gaze down at the jagged landscape below, follow the twist and turns of the Yukon River and see the outlines of the towering mountains. Once you’ve had lunch, grab a paddle and canoe a section of the Yukon River, one of North America’s longest waterways. In the past, it was the original transportation route for this territory. Bring a small camera or smartphone with you for some spectacular shots on the water. If you’re here during the summer, you’re in luck! The Yukon boasts an amazing 19 hours of daylight at this time of year, meaning you have plenty of time to enjoy your evenings. Jog by the shores of the river before dinner, or try whitewater kayaking for some thrilling fun. Located just 10 minutes from the airport by car, The Elite Hotel in Whitehorse is a comfortable and convenient option for short stays in the Yukon. For more tips, visit Travel Yukon. Before going home, why not sample the cultural delights of Yukon? 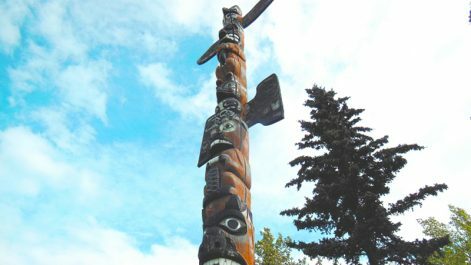 Start with the Whitehorse Art Walk, which passes the city’s Friendship Totem Pole – a symbol of unity and collaboration among all Yukoners, and representative of two major Indigenous clans of the region. 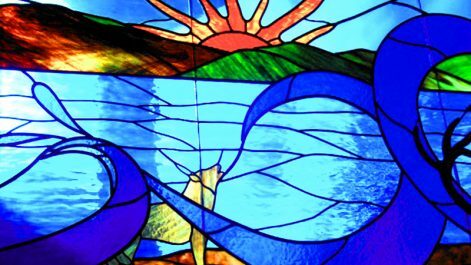 Other works along the walk include the Waves of History, a stained glass installation that acknowledges the power of water, and several murals painted by local children and youth. Later, check out some local art galleries and shops like North End Gallery or Arts Underground. Take some time to relax in one of Whitehorse’s bars and coffee shops before leaving. Appreciate the active and exciting journey you’ve had here, and look back on your photos with a flood of positive memories. For a real feast on your last day, visit Giorgio’s Cuccina. This elegant Mediterranean restaurant in the heart of Whitehorse serves delicious takes on both Italian classics and modern local fare. Fly to Whitehorse via Erik Nielsen Whitehorse International Airport. Whitehorse is also served by various ferries, such as BC Ferries from Vancouver and Prince Rupert, Yukon Ferries from Dawson City and Ross City and Alaska Marine Highway from Bellingham, Washington, Prince Rupert and coastal Alaska.